I started this project about 2 months ago and it's finally ready for publishing! I hope this map will set an example that it’s better to put plenty of effort in one very good map instead of little effort in countless awful maps. I've tried to put some new ideas in this map. Worms should be teleported where it says so they'll fall down on a minimap. The numbers denote the order in which each section should be roped. In each section, you will find a part where you can choose which way to go; one option has lock graphics in it, the other does not. If you stumble upon a lock, then you must first collect a key of the same colour (by shooting your rope at it) before you can go through with the map. Grey locks are an exception; in this instance, you must "kill" all enemy sprites in the room before the lock (either touch them with your worm or shoot them with your rope). 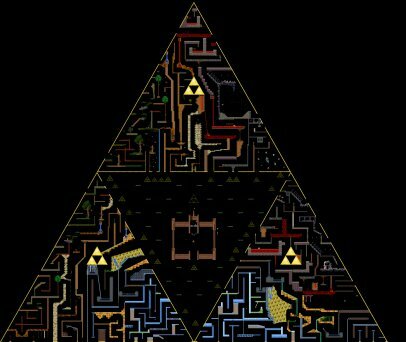 At every exit, there's a triforce with a number inside; in addition, there are a few signs that show where the next section is, so there is no need for extensive searching to slow you down. The finish is in Hyrule castle; touch ganondorf’s goomba to finish. The amount of easter eggs is not as high as you may be accustomed to in my maps, but I drew a blank due to having this map on my screen for too long. It is done! Props go to FFie for making the minimaps much cooler than what I originally had, as well as colour reducing and allowing me to use her stairs. Props go to Wyv for the idea of exits and entrances to an open spot in his kingsize RRs.